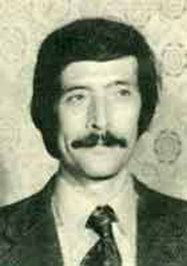 Bahram Sadeghi (born in Isfahan, Iran, 8 January 1937, died 3 January 1985), poet and noted modernist fiction writer of the 20th century, who explored new literary techniques with almost each piece he wrote. Sadeghi was the fourth and last child of a small retailer in Najaf-Ābād, near Isfahan, completed his elementary education in Najaf-Ābād in 1949, attended Adab High School in Isfahan for his secondary education. In 1955, he moved to Tehran, where he attended medical school at the Tehran University. In 1966, before finishing his medical studies, he began his military service and after the mandatory period of basic training, served the rest of his tour of duty in the Health Corp in Yāsuj, Khuzestan. When he returned to Tehran in 1968 he be Bahram Sadeghi (born in Isfahan, Iran, 8 January 1937, died 3 January 1985), poet and noted modernist fiction writer of the 20th century, who explored new literary techniques with almost each piece he wrote. Sadeghi was the fourth and last child of a small retailer in Najaf-Ābād, near Isfahan, completed his elementary education in Najaf-Ābād in 1949, attended Adab High School in Isfahan for his secondary education. In 1955, he moved to Tehran, where he attended medical school at the Tehran University. In 1966, before finishing his medical studies, he began his military service and after the mandatory period of basic training, served the rest of his tour of duty in the Health Corp in Yāsuj, Khuzestan. When he returned to Tehran in 1968 he began working in a clinic in Karaj, near Tehran and at the same time, continued his education at the Tehran University, and received his medical degree in 1974. In 1976 Sadeghi married Žilā Pirmorādi and had two daughters. He spent the rest of his life in Tehran. On 3 January 1985, a year after his mother’s death- an event that had a devastating effect on his life - he died at the age of 48 from a heart failure presumably related to his severe drug addiction, which had prevented him from writing in his last years and ended his life short. Sadeghi started writing poetry and prose at a young age and was still in high school when his poems, under the pseudonym “Sahbā Meghdāri” an anagram of his name (Sadegh Bahrami), appeared in literary journals of the period. Sadeghi’s fame as a modernist writer began with the publication of his short stories in his early 30’s (1950’s) which coincided with the years following the CIA-assisted military coup of 1953, a momentous historical event with profound reverberations on the nation’s psyche. His first short story “Fardā dar rāh ast” (“Tomorrow is on the way) was followed by the publication of several of his most noted short stories, such as “Obsession”, “Action-packed”, “The evening prayer”, “Counter-impact”, and “Mr. writer has just started to write”. The publication of the stories won Sadeghi instant prominence, and as noted by a critic, heralded the emergence of a writer who used irony in the very fabric of his stories, and grafted laughter and tears to create sarcastic grin. He also contributed stories to Jong-e Esfahān (Isfahan anthology), an independent, avant-garde literary periodical, established in Isfahan in 1965 by a group of young writers and poets. His most celebrated novella, Malakut (The Heavenly Kingdom), was published first in 1961, later in the collection Sangar o qomqomahā-ye khāli (The trench and the empty canteens, Tehran, 1970), and finally independently in 1971 (Tehran). The critical reception of Sadeghi’s stories earned him the prestigious Foruq Farrokhzād literary award in 1975.